One of last year’s best-performing hedge funds says the “trade of the century” is to buy gold and sell stocks as risk assets are due for another meltdown. It’s only a matter of time until the bearish bet pays off big, according to Crescat Capital LLC. While the Denver-based firm has only about $50 million under management, it has a history of outperforming the S&P 500 Index — with its Global Macro Fund returning 41 percent last year alone. Now the investment company says it’s ready to capitalize on an end of the economic cycle as indicators warn that a recession is imminent in the coming quarters. 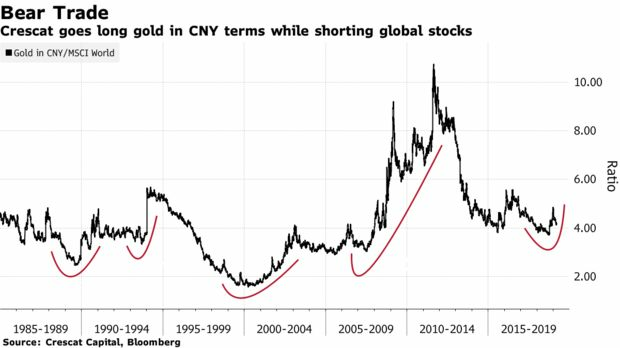 Going long gold in yuan terms and shorting global equities currently explains three-quarters of the hedge fund’s strategy. While the firm uses the MSCI World Index in models to visualize the trade, it goes a bit deeper with its short position, selecting individual stocks and exchange-traded funds to bet against. Among the warning signs, Crescat cites corporate insiders who are currently selling stocks hand over fist — indicating a potential stock bubble burst. In early 2017, those investors heavily sold shares while the S&P 500 continued climbing. That happened again in 2018. With the smart money selling once again, “the third time should be the charm for the stubborn U.S. market,” Crescat wrote to clients over the weekend. U.S. economic data is deteriorating and inversions remain across the Treasury yield curve, the hedge fund pointed out. 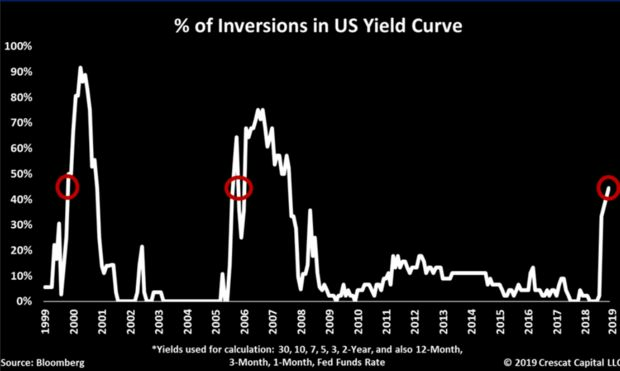 Measuring multiple yield spreads across the curve from Fed Funds to 30-year Treasury bonds, Crescat found that almost 45 percent of the curve is inverted. “The last two times the credit markets had such a high distortion, asset bubbles began to fall apart shortly thereafter,” Crescat wrote. As for the almost 13 percent rebound in global stocks in 2019, Costa said the firm has a high conviction it’s simply a bear-market rally. Just about everything has bounced since the start of the year, accompanied by an abrupt decline in the Cboe Volatility Index, or the VIX — signs reminiscent of head fakes in such advances. The firm’s Global Macro Fund has posted an annualized return of near 12 percent since it was created in 2006, according to its website — greater than the S&P 500’s 8 percent. Crescat’s Long/Short and Large Cap funds have also outperformed.